The best back exercise that I have found for strengthening the upper and mostly, the whole length of the back is the Pilates Arrow, or the Dart, as some call it. It is a great back extension exercise that, while it may be difficult to do, is very effective at strengthening the back extensor muscles while improving trunk stability. This upper back stretch exercise is helpful to improve your posture through the stretching action at the shoulder girdle complex and chest, while working your upper back and deep neck flexors that helps to support posture. -The picture shown to the left is a full version of this back exercise if you are able to clasp your hands behind you for more of an upper back stretch. -Keep your feet anchored to the mat while you lift up through the head, chest, and ribs feeling the back of the head and shoulder blades reach for the sky. Otherwise follow the instructions below for a modified or varied version of this best back exercise. Find this Back Exercise in the new revised Pilates ebook with over 50 pictures and descriptions of exercises compiled for you. Position: Lie on your stomach with your forehead on a towel and arms at your sides with palms face up. Your feet, knees, and thighs are heavy and stay on the mat throughout this best back exercise. Do not tense them! Action: Zip up your abdominal muscles like putting on a tight pair of jeans and hollow out your pelvis. You can feel this hollowing by gently pressing your pubic bone into your mat, do this without squeezing your buttocks. Keep your forehead on the pillow and just raise your arms up and lengthen through the spine. Feel your shoulder blades come together gently as you raise your arms up and back with your tummy tight. Hold for a full breath sequence in and out then lower and repeat for 4-6 repetitions. Caution: Back extension exercise is not recommended for those with spinal stenosis. You may modify this best back exercise by placing a small rolled up towel or pillow under your pelvis to keep your back slightly flexed. Lift your chest and head both off the mat, keeping your nose pointed down. Raise your arms up and reach for the end of the mat. Feel your shoulder blades working by pulling your arms up and together clasping your hands if you are able. Hold this position for 3-5 breaths, breathing in and out. Repeat 3-5 times. Notes: Keep looking down and reaching out through the crown of your head. 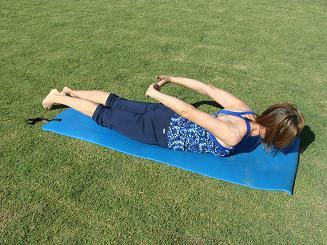 Keep your abs zipped up and shoulder blades sliding down your back. Hold for 3-5 seconds then release and repeat for 6-8 repetitions. You may place a small pillow or towel under your pelvis so you won’t overextend your lumbar spine. Check out all of the Exercise of the Month Moves! Pilates The Hundred for a Great Warm-Up! Pilates Bridging for Pelvic Support. Check out the Cat Stretch here after leaving best back exercise.